Over-current protection over-voltage protection over-temperature protection to keep your safe. At first, this was a difficult product for me to give 5 stars to. Not that it's a bad product -- it's really a good one.Let me explain...I am in the process of buying wireless chargers for every room of my home. I have been trying different brands and you can read many of my reviews by clicking on my profile.This particular charger seemed very interesting in the way that it lights up when you place your phone upon it. I figured I would take the opportunity to try it and if I didn't like it I could return to Amazon.I was very surprised when this arrived at my home. The box was pretty large for a charging device. I guess I didn't read the size specifications very carefully as, upon opening, I found a charger the size of a small pizza. No kidding!The charger comes with a cable but no adapter. You are going to have to supply your own adapter that is at least rated for 10-12 watts.I placed my iPhone XS Max, still in its Apple folio case, upon the charger. Instantly, a circular pattern of lights appeared. Really, really cool! My phone then made a "beep" sound to indicate that it is indeed charging.I must say, this is a really cool charger. It's a novelty item, but at the same time, it charged my iPhone as quickly as the top-rated Mophie charger which is similarly priced.There are some drawbacks. First of all, I don't know why this pad has to be this large? 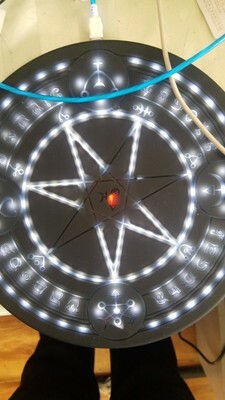 Maybe it's because of the WOW effect that you get when the "runes" fully light up. However, the size of this device makes it difficult for just placing it anywhere. Also, the charging cord that comes with it is extremely short. Ultimately, you are probably going to opt for purchasing a larger cord.With the cons aside, I gave this charger a full 5-star rating just for its WOW factor and for being the most unique charger of its kind. 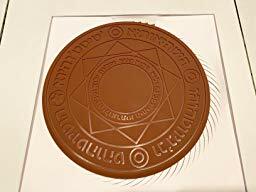 I have never seen anything like this before and it certainly will be a huge conversation piece in your home.I do recommend it highly as long as you are aware of what you are getting. Large enough to charge two phones at once! 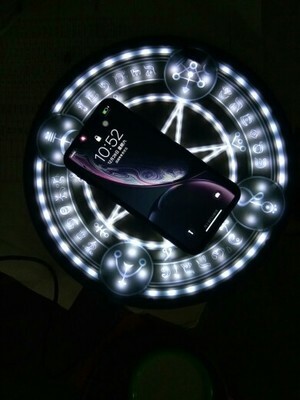 I love how it lights up when you place your phone on it, it looks so cool. You do have to be sure your phone isn't too far from the edge or it doesn't always sense it. But it's large enough for two phones to charge at once! One thing, it uses a fast charging USB-C charging cord but comes with a Micro USB cord for some reason. So you'll want to just use your regular faster charging USB-C cable. 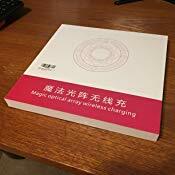 I love the Magic Array Wireless Charger: it is very elegant and works flawlessly. Unlike my two other wireless chargers, which don't always start charging the phone right away because the phone had to be aligned in the right position for charging to begin, this wireless charger works every time. The charger also lights up as you start charging the phone, which looks very pretty. 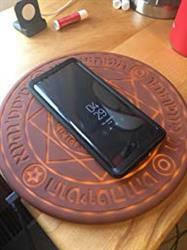 I really love this wireless charger. The criteria I used to review this product is ease of use, value, design, and durability. The unit itself is very sleek and has a nice aesthetic appeal. It works with any Micro USB cable, and it comes with a cable that plugs into any USB adaptor. The unit is plug and play making the ease of use incredible and the user experience is seamless. The user can simply drop their phone on the charger and it charges the phone wirelessly. There is a beautiful lighting effect that goes all around the pad when you plug it in and when a device is charging. The unit is also very solid in its build and feels like it would be quite durable. I did not stress test my unit but I think it's safe to say it could sustain most wear and tear for an average user. This product allows anyone with a wireless charging functionality the ability to access and use this feature for a moderate cost. The price is a little high due to the size of the pad. 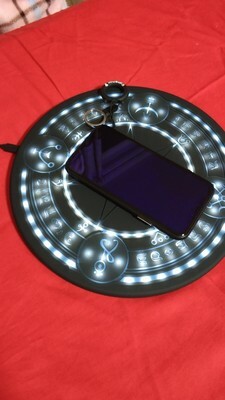 You can put the device almost anywhere on the pad and it will begin charging. The sleek profile and design of this product make it fit for any area of the home or workspace.All in all, this product is a great value and makes it incredibly easy and cheap for anyone to access the full potential of their smartphone by activating it's wireless charging capabilities. This product is perfect for anyone with a smartphone that has this capability. I would highly recommend this product to anyone that is interested in a wireless charger. You can't go wrong! Just received this item and was surprised at the quality of the product. It comes with the wireless item and charger. Can't wait to use it!